St. Francis of Assisi’s prayer “Lord, make me an instrument of your peace…where there is hatred, let me sew love; where there is injury, pardon” has been her inspiration. Through it, she has found joy and satisfaction. Our Sister Maretta Kurk was born in Quincy, IL, on June 15, 1932, and named Norma Jean. She recalled how her parents, Clarence and Edith (Schaich), instilled in their four children a good work ethic, the importance of prayer, and the reminder to be charitable. She was raised on a farm and responsibilities included milking the cows, tending to the house, and being ready to be called upon for whatever was needed to be done. There were also light-hearted moments including barn dances with family and neighbors in the summer. 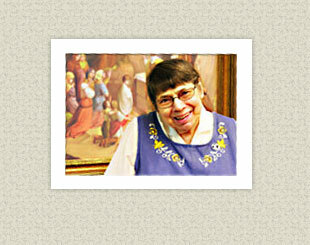 Overall, her Franciscan roots have always been a part of her life, and life on the farm brought her closer to creation. The Hospital Sisters of St. Francis founded St. Joseph’s Home for the Aged and Infirmed (Monroe, LA) in 1944 and transferred ownership in 1974. They also staffed Our Lady of the Ozarks Home Nursing Center from 1945-1977 and founded St. Anthony’s Kindergarten in 1949 and ceased providing services there in 1977 (both institutions were in Carthage, MO).